Going on a trip for eight months is not something you decide on a whim. It’s a big step that is usually preceded by a lot of thinking and research online. Here is how it went for us. And just like that we decided: a trip of eight months, from Argentina to Mexico! How to decide on the budget and the itinerary? First we wanted to know how much money would be needed for the trip and to do so, we needed to have a better idea of our itinerary. This is when we started to put our nose in our big collection of travel guides. Reading the guides made us even more excited about this trip than we already were (if that is possible). 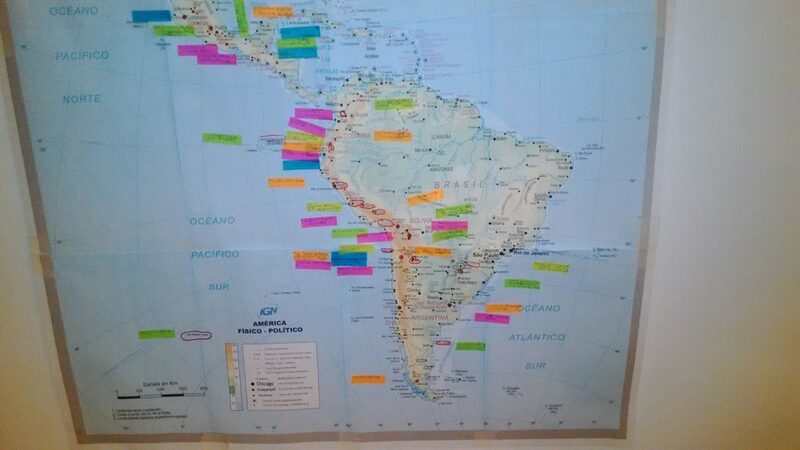 We also decided to print a big map of Latin America, that we put on our wall and where we could pin all the places we wanted to go! It was really fun to do! What better than a self-printed map to collect all the information? Not long after that, we found a really useful website called the planificateur. On this website, you can create your own itinerary, deciding how many days to stay in every place and how long it will take to get there. It also gives you an estimation of how much money will be needed and tells you when is the best time to visit each place. It has many other cool features and it really helped us to prepare our itinerary and budget! In the comparison, we also included the insurance of our French credit cards. It turns out that Visa Premium and Gold Mastercard offer quite a good coverage but limited to the first three months of the trip. For the remaining five months we chose Chapka Cap Aventure as it offered the most complete coverage at a reasonable price. Their website is really user friendly so it is easy to find the information you are looking for and they always reply really quickly to all our questions. They also have different insurances tailored on your needs: voluntary work,work and holiday visa, short holidays, and more. In case of long trips, bank fees could affect a lot the total budget. Our banks would charge quite a lot for every operation not in euro, so we looked for the best option and that meant… Excel time! After a lot of comparisons, we decided to try the neobanks Revolut and Max. We thought it would be better to have two different cards we could use abroad in case one was not working or got stolen. To have the Revolut card you just have to pay 6 euros to get the card delivered, put some money on the card (top up) and you can pay in many currencies at the current exchange rate. A downside for the owners of a Mastercard gold (like Paolo) is that the top up using this card might require to pay a percentage. In all the other cases (transfer or using other credit cards) the top up is completely free. The general downside for us is that you can only withdraw 200€/month without fees. We are going in a lot of countries were cash is much more used than credit card and 200€ didn’t seem enough. So we kept searching and we found Max, a card aggregator completely free of charge. This means that you can “pair” this card to any other credit card you might have. The interesting part is that there are no fees at all when you want to pay or withdraw money outside Europe, which was exactly what we were looking for. The app on the phone still needs a lot of improvement but otherwise it was really the best option! Note that Max is only available for people living in France. Another good option would be N26, which would have been our card n°2 if we had not decided to use Max. Although their advice were not as insightful as we wanted, they still answered our many questions. One of them was about the rabie vaccination. Searching online, we found all kind of opinions about the necessity of this particular vaccine. They answered us that if we don’t plan to have trips in very isolated area and/or really adventurous, then it is not necessary. In any case, vaccine or not, if we get bitten by an animal, we would still have to go directly to the hospital and take curative shots. 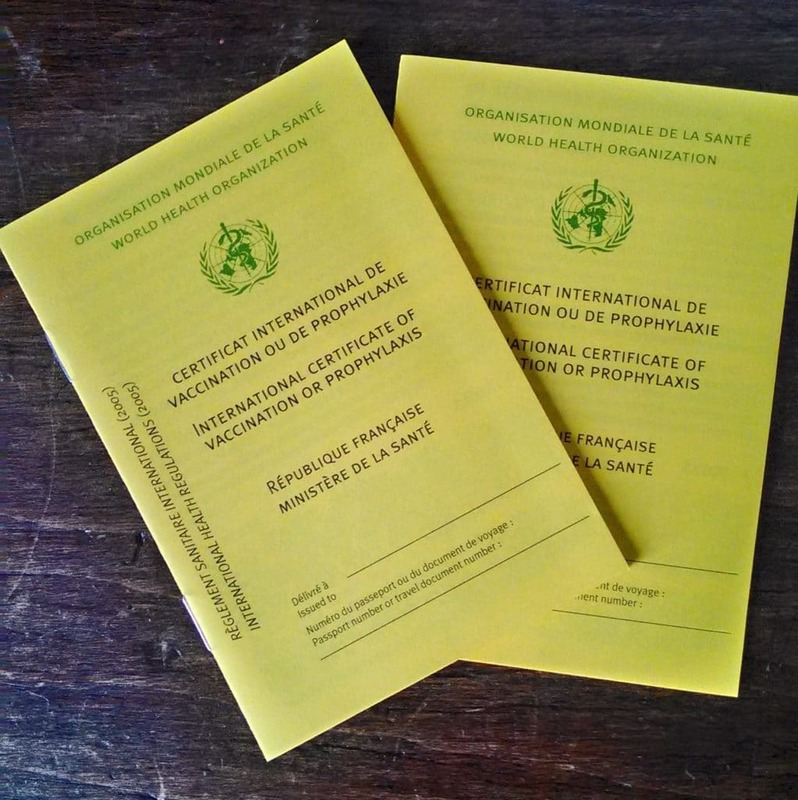 Our international certificate of vaccination ready to be checked! Make sure you have your international certificate of vaccination before leaving! They might ask it when crossing the border! Which vaccination is needed highly depends on trip, activities, and person so make sure you check with your doctor what is needed before your trip! Since we decided to visit Easter island and the Galapagos we knew we would have to take the plane several time during the trip. Once we had a pretty good idea of what our itinerary would be, we checked Skyscanner to have a rough estimation of the flights prices. We hesitated a lot between buying directly our tickets using Skyscanner, google flights, etc. (having to wait since the tickets were not available yet) and contacting a travel agency. After some research, we decided to contact three travel agencies, specialised in long trips and world tours. One of them, Zip World, really convinced us with the price they proposed and by their quick replies to our many questions. We asked them to do some changes at least six or seven times before accepting their proposition. They always reply within a few hours, even at night! The price we paid was much cheaper than if we had bought the tickets ourselves. Plus their website is really clear and it’s easy to keep track of all our flights. We are going to have a nomadic lifestyle for eighth months, so we can’t bring too many stuff with us. The bigger the bag, the harder to move around, because you never just fill half of it. 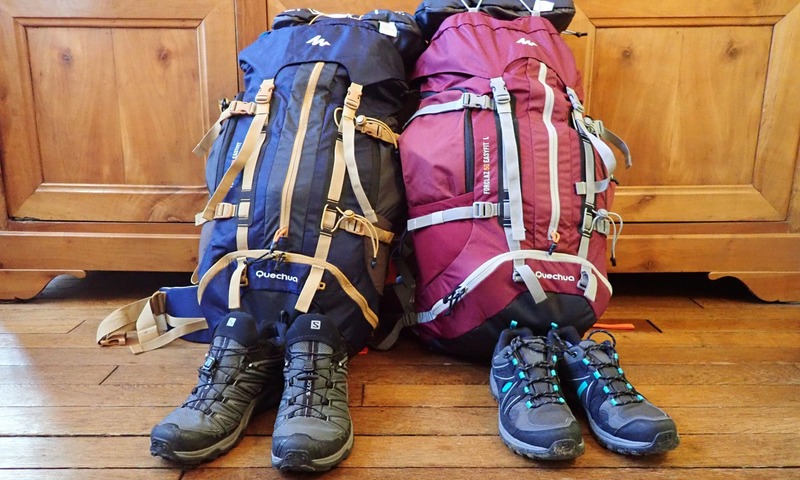 From our experience with the Camino in Spain, we decided that a 50L backpack should be big enough and not too heavy even when completely full (we are aiming at 12 kg maximum each). To be able to fit everything in our backpack, we decided to take a lot of light and versatile clothes and material. We are going to encounter all kind of weather in all seasons. Clothes for both warm and cold countries were therefore at the top of the list. Synthetic materials are the cheapest option. In fact they are great also because they dry fast and are usually light. But they have a big problem: they smell terribly! After a couple of hours wearing them, even faster when used a lot, you might start to notice people around you taking a step back. So we looked for an alternative and we found merino wool. Many companies started to use merino, mainly for their sport collections. It does not smell, dries fast, and regulates the body temperature. Although merino wool is in general more expensive, it is well worth the price. 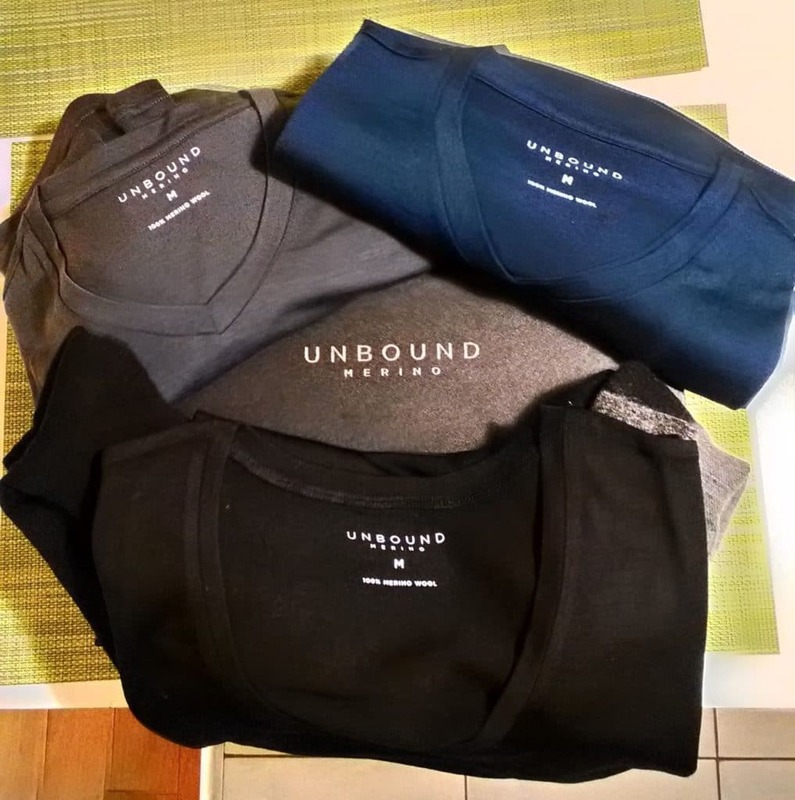 Not wanting to have only sports clothes we opted for some Unbound Merino material (shirts and socks), with a more casual look, perfect to sightsee! After all these considerations we realized that there were also some health related issue we should think of. Caroline has a sensitive skin that goes from white to red but never gets tanned. Moreover, she has a high risk of skin cancer due to her many moles. But even without a sensitive skin, we should all protect our skin the best we could. And this is especially true in the really sunny countries, on the Andes at high altitudes, and in Patagonia where the ozone layer is thinner. So we looked for anti-UV clothes and we found out that apparently merino wool has also natural sun blocking properties! Awesome! The other thing we wanted was to have as much protection against mosquitoes as possible. And no, merino wool is not naturally anti-mosquito (It is already awesome enough without it). There are two possibilities to keep annoying insects at bay: soak normal clothes in special repellents or use adapted clothes. We decided to buy some adapted pants through which the mosquitoes cannot bite, like the ones from Craghopper. In addition we will impregnate our remaining clothes with repellent. 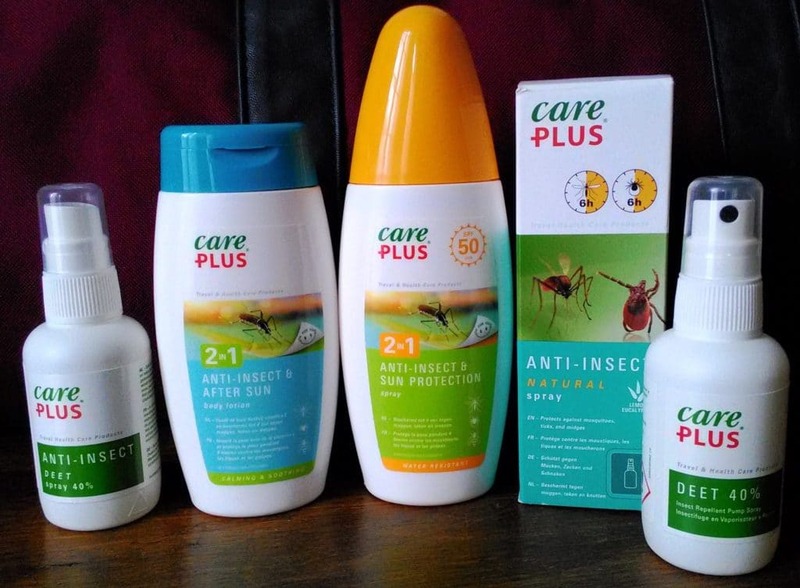 And to take care of the exposed areas we’ll use a special sunscreen/repellant from CarePlus that will save us from both the sun and the bites! The Sun can become quite a problem, mosquitos are always annoying… better to protect against both! Bottles with filter: cheaper and much more eco-friendly as we won’t have to buy plastic bottles, . We were conquered by the Katadyn BeFree, light and easily packable when empty. 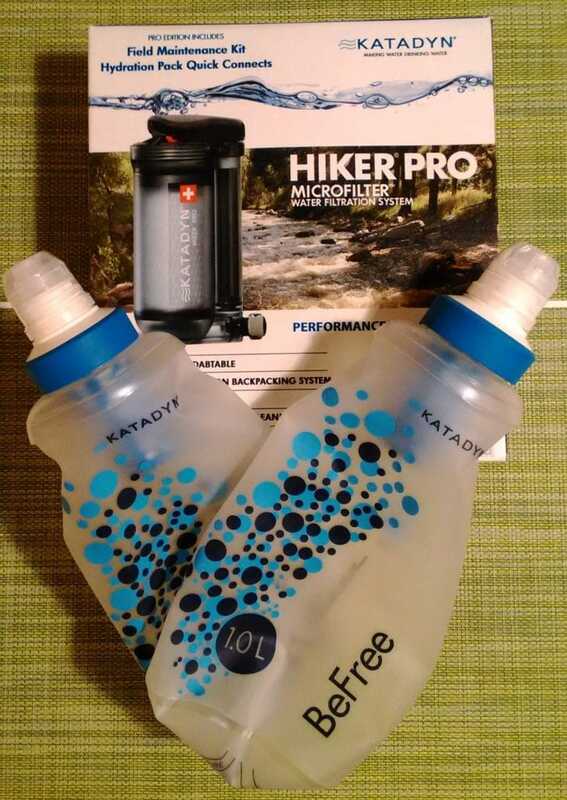 Pump to filter water from Katadyn: to be ready in every situation! Foldable and light backpack: there are some super small ones that don’t take any space and are perfect for a daytrip. Hidden pocket: to keep some money in a safe place at all time. Protection bag for our backpack: to use it on the plane or on the bus. On the long run, it is cheaper that putting plastic around your backpack each time you have to check in for the plane. It is also possible to close it with a locker. External battery: to never remain without charge in difficult situations. Ours has also a solar panel. Universal adapter: the plugs might be different! Solid soap and shampoo. Much easier to bring around than the big bottles and you can also use it to wash your clothes. Menstrual cup for Caroline. More hygenic, practical and eco-friendly. Frontal lamps: So we can start walking before the sun is up and find the perfect spot to look at the sunrise. Playing cards for the many hours of buses. Documents: Apart from the passport and the international certificate of vaccination, remember that if you intend to drive, you might need an international driving license in the country you’ll visit. We also scanned everything and made it available online . First aid kit with some basic medications. Depending on where you go, you might need to filter your water. Tour du mondiste: Everything, from budget to equipment. Voyage de miel: One of their three posts on what to put in your backpack (and it’s in English!). Alex Vizeo blog: Nice tips to prepare a long trip from someone who did it. Les globe blogueurs: For their detailed budget of 10 months in Latin America. If you would like more information on a specific item or have any other question let us know in the comments below! And tell us: what is the item you absolutely need to have with you during a trip? For Paolo it’s his earbuds to listen to some music, and for Caroline an action figure of Toad to show him the world.